Explore the prairies like never before. Between 50 to 90 percent of the potholes in some regions have been lost or severely degraded – a trend that continues today. Sixty to 90 percent of the original native grasslands have been lost, and loss of native and restored grassland continues today. 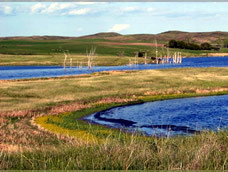 Shallow lakes in the eastern portion of the PPR are severely degraded by high water levels and rough fish populations caused by wetland drainage systems. Habitat programs delivered by DU and its partners on the Prairie Pothole Region are among the most aggressive on the continent. Programs include perpetual protection of native habitats through easements or ownership, conversion of land use to functions more favorable to wildlife, and stewardship programs. DU's Preserve Our Prairies initiative aims to perpetually protect almost 600,000 acres of the most productive remaining waterfowl habitat. The cross-border initiative covers North Dakota, South Dakota, Montana, Wyoming, Manitoba, Alberta and Saskatchewan. DU employs satellite imagery and Geographic Information Systems technology to examine rates of grassland loss in the Coteau region and target conservation efforts. DU's Living Lakes initiative seeks to protect and enhance 400 shallow lakes across Minnesota and Iowa to improve spring migration habitat.